I started off with two lengths of scrap 2x4 each measuring 11" long on the table saw. Why 11"? 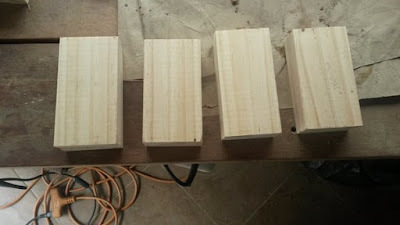 well standard sandpaper sheets are 11", it is my intention to use a 1/4 sheet on each block, and eventually these 11" blocks will be cut in half. 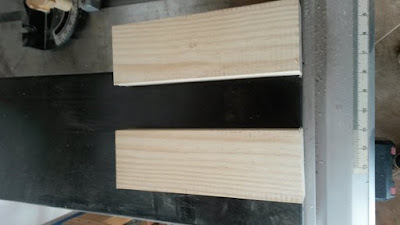 The idea is to cut the 2x4 in half in each direction, so as I said above, they will accept the cut sheets, but rather than covering the whole block and wasting sandpaper, I am cutting the block to make like a sandwich, the idea being that the sandpaper will wrap around the bottom half, and be kept in place by the top half. 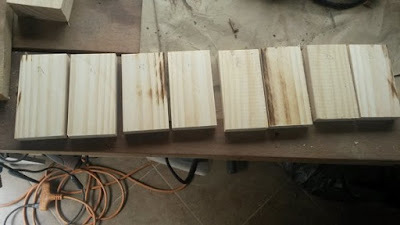 So the first job was to cut the blocks to the required length of 5 1/2"
I them cut these in half again, but the lower half is thinner than the top, to accommodate the sandpaper. labelling each pair with a letter. 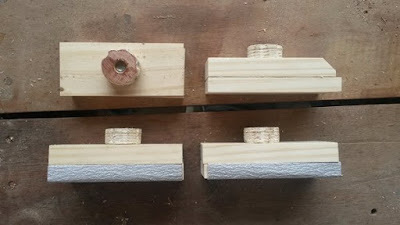 many designs cut a shallow dado in the bottom piece, and cut their top piece narrower to fit in the dado, the idea being to pinch the sandpaper in place. However why make work for yourself, there is no need for that, you can, as I have done, simply run a bead of hot glue down each side of the lower piece, this acts like a not slip gasket, and stops the sandpaper from pulling out from between the wooden sandwich. 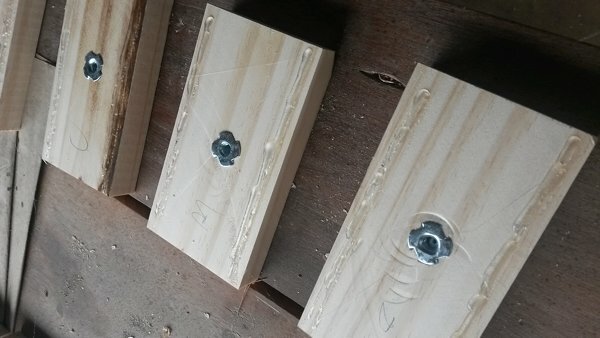 I then made some simple knobs out of 3/4" plywood and epoxied a 1/4" bolt into each. 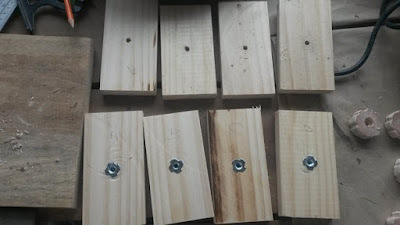 These then slot through the top half of the sanding block, into the T-nut below, once you have your sandpaper in place, they are tightened, and your sandpaper is going nowhere until you want to change it. I now have four sanding blocks, one with a shaped end for getting into tight corners. I can either put in different grit in each, or load them up with the same grit if I have a big project, such as the dining table and chairs, that way I am not wasting time changing sandpaper. The final dimensions of the blocks are 5 1/2" long, by 2 1/2" wide by 1 3/8" deep. The only addition to this may be that in the future when I have my router out for a bigger job, I may put a roundover on the tops to make them more comfortable in my hand, but they work, and I should have done this before starting the dining room suite. 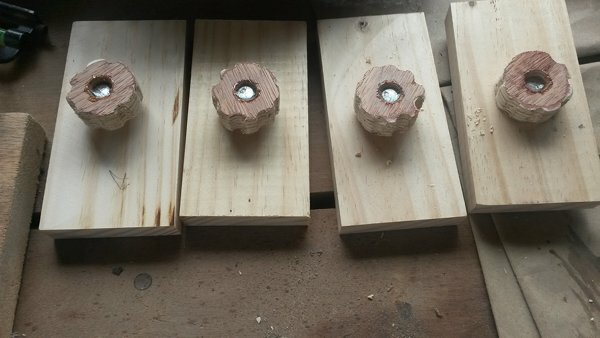 This project cost me nothing as it was made from scrap and hardware I had in stock!